If you'd told me a few years ago that I'd spend a pleasant evening eating dinner in the Payless Shoes parking lot, I'd have laughed. But that's what I did tonight. 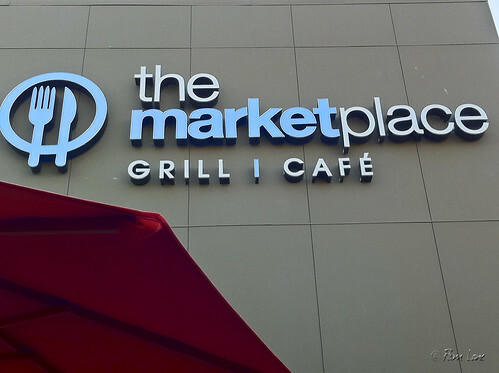 Actually, Payless has been gone a couple of years now, and in its place, the Marketplace Grill and Cafe opened this week, with its patio dining area where we ate our dinner. There are hints of Greece here and there, from the sign at the order desk ("everything is cooked with Greek Extra Virgin Olive Oil," or "liquid gold") and the Greek salad served with dinner to the assistant general manager ("I'm not Greek, but I'm married to one"), Sandra Efstathiou. What was most astonishing was the service! Because we ordered and paid at the counter inside, I didn't expect to be taken care of. But we were, from the time we were seated to the take-out boxes cheerfully provided before we left. And not just the rote "Welcome to..." greeting. Everyone, from Sandra down to the busboys, was determined to see that we had a magical experience that would ensure that we will come back. And it worked. I'm already looking forward to my next meal there. 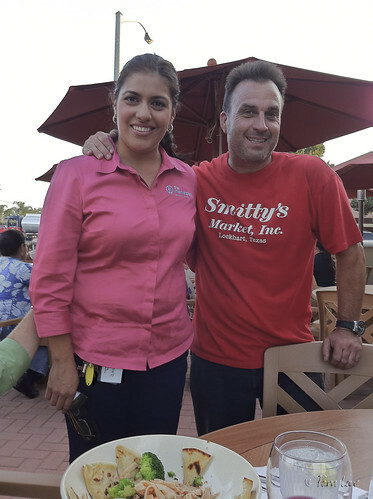 See ‘Hip, cool’ restaurant sees an opportunity for more information about the restaurant from the Downey Patriot.